Cheapo fridge from Sears Outlet + temperature controller = home curing chamber. 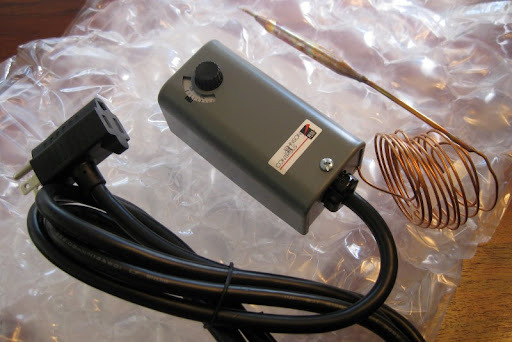 Our temperature controller is a Johnson Controls Refrigerator Thermostat that we purchased from Northern Brewer. The unit gets plugged between the fridge and the power outlet so that it can cycle the fridge on and off to maintain a (reasonably) constant temperature. 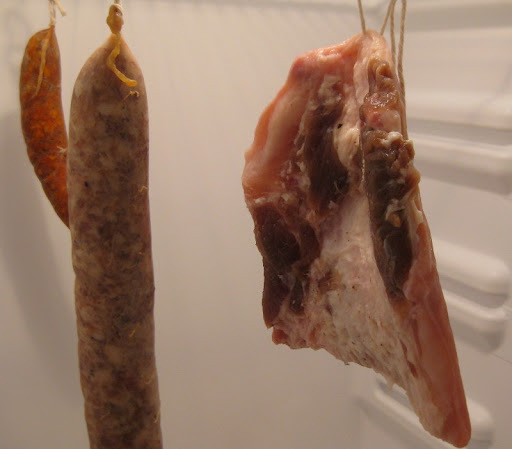 We're currently curing some Saucisson Sec (a very basic cured pork sausage) and some Spanish-style sausages that we've enjoyed smoked and are curious to try cured. Oh, and since we had a pig jowl from Da-Le Ranch, we're taking a crack at some Guanciale. Ummm, a thing of beauty. What is the process that is going on here? Is the fridge cold or warm. I am curious. Congrats! That is exactly my set-up -- down to the "S" hooks. Make sure you keep good humidity in there; you might want to buy a humidity gauge. What are you curing (other than the guanciale)? could you post instructions and a parts list to recreate this awesomeness? Ok, I guess the original post was a bit light on the details :-) I've updated it with some more info. Becky - we're currently keeping the fridge at around 55°F. Hunter - we've got a water pan (one of the vegetable drawers, to be precise) in the fridge for humidity. We should get a gauge to monitor it, though. Pork Jowl drool........... Nice setup thats awesome! Was the freezer section removed? Nope - the only physical adjustment we made to the fridge was to add the temperature controller. did you drill a hole for the temperature controller? How did you install it? Nope - no hole required. One of the reasons we bought the controller we did is that the wire is thin enough that you can just run it out the side of the fridge door. Other models, however, looked like they were thick enough that doing this wouldn't be practical. It is BRILLIANT! Quick question - what humidity procentage you thing should be in there for curing meats? Hi Gabi, Thanks! The humidity level should be at least 60% (75% is ideal). 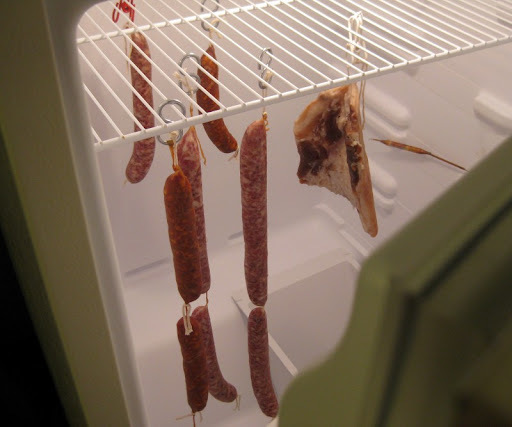 The high humidity level is most important near the beginning of the curing time since you don't want the outside of the sausage or meat to dry out and harden before the inside can lose it's moisture. What temperature did you set the fridge out. This is exactly what I was hoping to to do soon and then I found your blog for a perfect reference! You know of course this is also a lagering cellar. Of course you do. Jason - we initially ran the fridge temp around 55°F. Now, since we have beer kegs in there as well, we run closer to 50°. David - yep, the thought that it could be used for brewing lager definitely crossed my mind. We haven't tried it yet, though. I have used jowl to make "poor mans bacon" and quite honestly, it was probably better than using a belly. I don't know if you have tried it before, but I found that it was meatier and still had enough fat to render off during the cooking process. Hi Dale - we haven't used jowl to make bacon, but I bet it would be good! Oh GOODIE! I'm glad I found your site! Thank you! ...my wife...not so glad just yet. She will be though! She loves good salume!